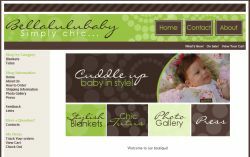 The Bellalulubaby Company creates products for simply chic tots and their fashion forward moms. Bellalulubaby was created by mompreneur Paula Seguin who felt compelled to develop this luxurious line of products that were inspired by her own little girls. The growing line of baby and infant goods offered by Bellalulubaby includes quality handmade blankets and a selection of fanciful tutus. The chic styles range from the fun and whimsical to the refined and elegant with something for every child and mom. We are giving away baby blankets of choice to 3 of our lucky readers! Also exclusive to our readers is a 20% discount from your entire order for the next 30 days (offer ends February 19, 2009). All you need to do is enter code CBSBLB1 at checkout. Would you like to enter this amazing giveaway? Stop by The Insider and follow the instructions! Next articleNew Program Helps Women Business Owners Achieve The "New American Dream"